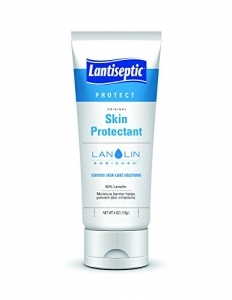 Protect skin and promote healing with lantiseptic skin protectant. Lantiseptic skin protectant is a an emollient ointment intended to protect chafed or ulcer prone skin, promote the healing of skin injuries and serve as a first aid treatment. It is formulated to encourage the proper moisture balance of the skin, thereby supporting the body's natural healing process. This unique high lanolin formula can be used for preventing and treating a wide variety of skin conditions. Skins conditions include diaper dermatitis, ulcer prone skin, incontinence associated dermatitis, reddened or cracked skin and burns or other skin injuries. Gently cleanse and dry area. Massage liberally into affected area as needed.